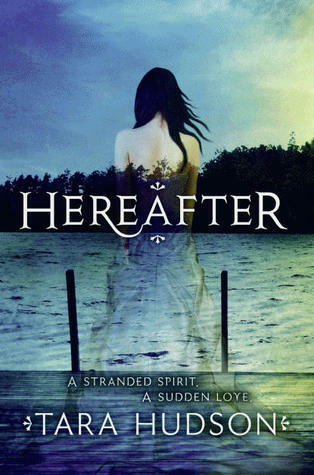 It felt new and it felt unique....see what I have to say about about Hereafter #1 Hereafter by Tara Hudson. Can there truly be love after death? Drifting in the dark waters of a mysterious river, the only thing Amelia knows for sure is that she's dead. With no recollection of her past life--or her actual death--she's trapped alone in a nightmarish existence. All of this changes when she tries to rescue a boy, Joshua, from drowning in her river. As a ghost, she can do nothing but "will" him to live. Yet in an unforgettable moment of connection, she helps him survive. Amelia and Joshua grow ever closer as they begin to uncover the strange circumstances of her death and the secrets of the dark river that held her captive for so long. But even while they struggle to keep their bond hidden from the living world, a frightening spirit named Eli is doing everything in his power to destroy their newfound happiness and drag Amelia back into the ghost world . . . forever. Thrilling and evocative, with moments of pure pleasure, "Hereafter" is a sensation you won't want to miss. Is there something waiting for us on the other side? That is the one question that plagues us all. What happens when we die? Do go to heaven or hell, or the stories about the Underworld in Greek/Roman mythologies or the belief of moksha or the Christen believes actually true...but more importantly can you love after you have died...and this is what the story is based upon. Hereafter is....a great piece of writing...I know that doesn't say much about the book but don't worry i'm going elaborate. One of the greatest factors about this book is its writing..how Tara Hudson's words make it so much compelling. Then there are the two protagonists, Amelia and Josh. Amelia is a stranded spirit, who had died sometime ago by drowning in the mysterious black river and then there is Josh, he is the human whom Amelia had somehow saved. Josh is the only one who can see her and somehow he is also the only one who can make Amelia feel. There chemistry and their romance is definitely very lovely and like a light in darkness. Being a ghost and a human they somehow make it work. Then there is Eli, the bad guy...he is definitely perfectly suited for this role of a Harbinger of doom and he wants Amelia to join him but she is less that inclined to do it....good for her. Now lets see the cons of this book. There is only one actually and that the love between Amelia and Josh. I know this is supposed to be a work of fiction but its still a tall order to digest the fact that Josh, a human and Amelia, a ghost are in love with each other and want to stay together. Granted Amelia's story is a sad one, she had no one to guide her in her afterlife and Josh is the only thing she knows but someday or the other she needs to move on. On the whole its a pretty okay read and not too great. Maybe I can give the next book, Arise a try. "Strangest couple ever seen - a sudden love between a ghost and a living human"
Ugh I really dislike ghost and human love stories. I just don't get it!! haha. But I've heard that the writing in this is really great. Lovely review, doll!